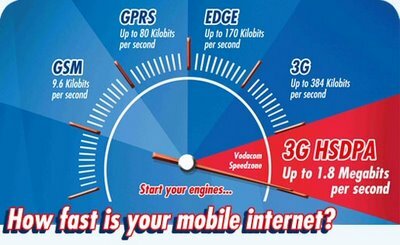 I always thought Telkom's ADSL pricing was pretty excessive at R99 per GB (R0.10/MB), until I saw the cost of Vodacom's 3G offering. It's stratospheric! R2.00 per MB if you exceed your "contract" allocation - that's R2048 per GB. If you buy a 1GB contract, it's "only" R499 (R0.49 per MB). So it may offer fast speeds (no guarantee) but it's even faster on your wallet! Did I mention that Telkom owns a large share in Vodacom? The graphic is quite interesting: in their bid to show how fast HSDPA is, they are also pointing out how slow their current service is. If you can get a signal, and it isn't overloaded with voice callers, then anything above 9.6kb is a bonus. All I can say is that you'll have to have a damn good reason to buy bandwidth at these prices. Of course, there is absolutely no truth in the rumour that the reason why it is all so expensive is the stranglehold Telkom has over international internet access. None whatsoever.